In 1969 the French novelist George Perec published his novel La disparition, a lipogram written without ever using the letter ‘e’. This Artists’ Book – Perec – was inspired by his experimental novel and by a collection of alphabets ‘for Architects and Designers’, published in 1965. 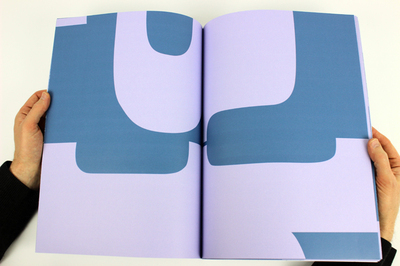 The original book of letterforms is an oversized volume, hence the size of the Artists’ Book that responds to it. In the book, there was one font in particular, a slab serif with a delightfully curved body, which due to the sizes of the characters, are not arranged in alphabetical order, and the juxtaposition of the letterforms creates the most wonderful negative spaces between the characters.